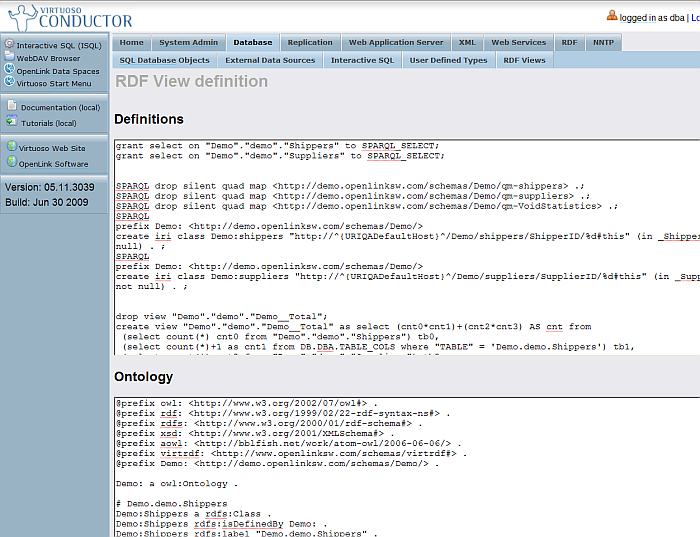 To this end, Virtuoso includes an HTML-based Wizard interface for dynamically generating & publishing RDF-based Linked Data -- essentially RDF-based VIEWs -- from relational data sources. Note: In the Open Source Edition, this can only be used over locally-stored, Virtuoso-based SQL data. 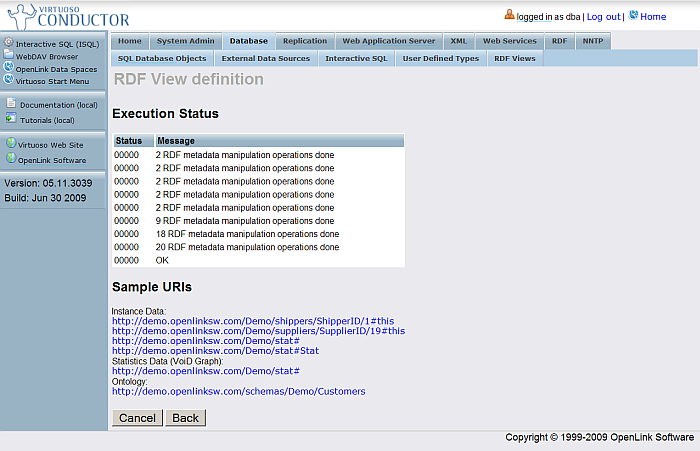 With the Commercial Edition, local or remote ODBC- or JDBC-accessible data sources can also be exposed as RDF-based Linked Data. Check to ensure the cartridges_dav.vad and fct_dav.vad VAD packages are installed using the System Admin -> Packages tab of the Virtuoso Conductor. If not yet present, use the Install button to the right of the package to install now. If the data is hosted in the same Virtuoso instance, skip to the next step. 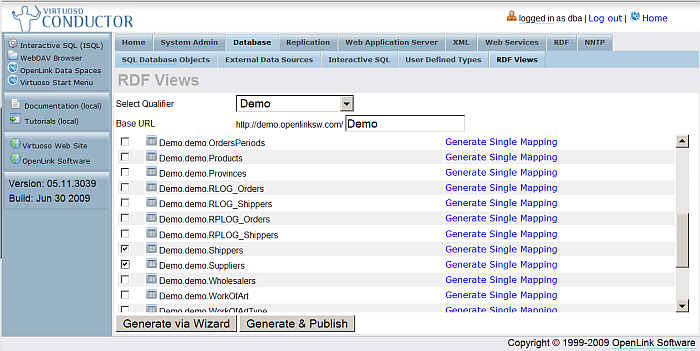 Identify the ODBC or JDBC data sources that host the data you seek to publish. 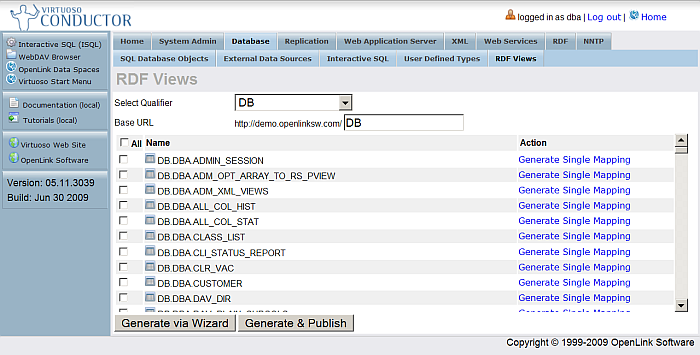 Attach/Link TABLEs and/or VIEWs from the external data sources into Virtuoso via their Data Source Names (DSNs). In the Virtuoso schema, locate the local and/or linked TABLEs and/or VIEWs that hold the data you wish to publish. 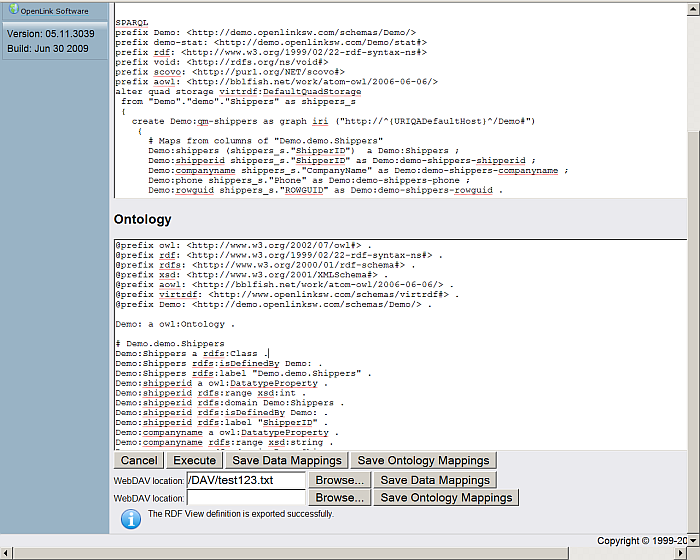 Use the Linked Data publishing Wizard to produce a Data Source Ontology and associated Instance Data. Configure Endpoints and Re-write Rules to disambiguate data object (resource) identity and description through HTTP-based content negotiation. Expose the Data Source Ontology and associated Instance Data in Linked Data form through those Endpoints and Re-write Rules. These steps may be largely automated (the One-Click Deployment below), or performed manually (Using the Conductor's HTML-based Wizard further down). Go to http://<cname>:port/conductor. Note, the appropriate cname (hostname) and port number for dereferencing URIs must be set for the URIQA DefaultHost Virtuoso configuration parameter before creating the Linked Data RDF views. Virtuoso will perform the entire process of ontology generation, instance data generation, and linked data deployment (re-write rules generation and application). Error messages will be presented if the Wizard encounters problems. 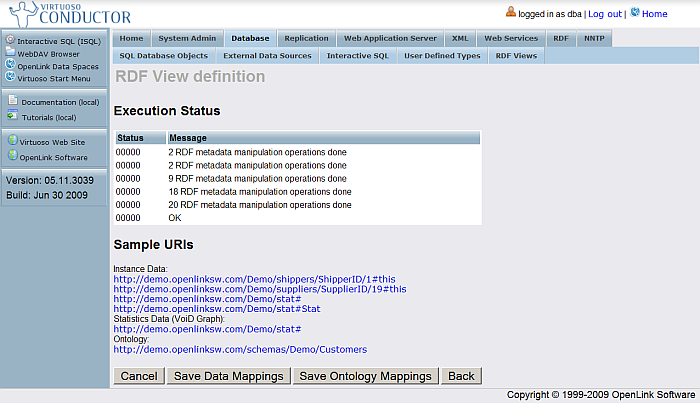 If there are no error messages, your RDF view declarations and Linked Data publishing activities will have completed successfully. Click on the "Cancel" button to return to the initial Linked Data View Generation form. At this point, you are presented with the option to edit your column selection. Select the "Edit" link, for example, for table Demo.demo.Shippers. 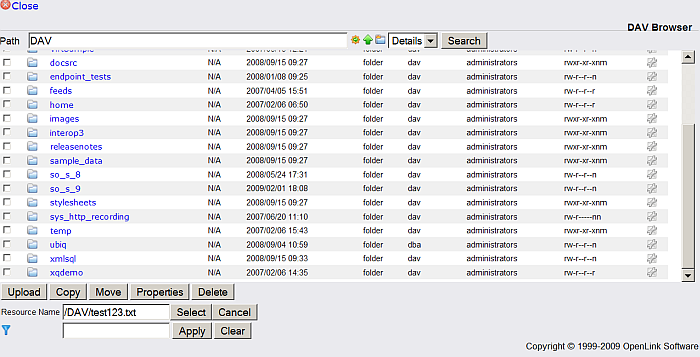 Enter a WebDAV resource and click the Select button. Note, the WebDAV resource path value will be shown in the WebDAV location field. 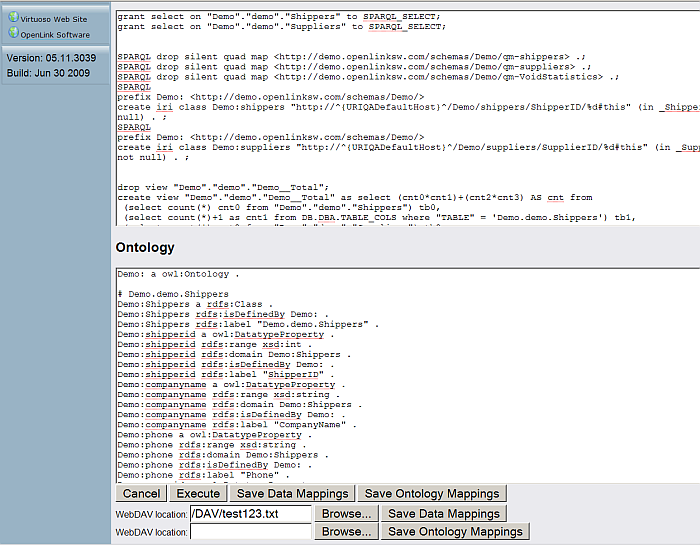 Then click the "Save Data Mappings" or "Save Ontology Mappings" button, to complete the option task of saving your generated (or edited) view declarations. Click on Cancel to return to the initial Linked Data View Generation form.